Lake Sammamish is a 7-mile-long, 1.5-mile-wide freshwater lake that lies just eight miles east of Seattle, minutes from downtown Bellevue and the Microsoft Campus in Redmond, making it one of the most highly sought-after areas to own waterfront property. Lake Sammamish waterfront real estate owners can enjoy many activities steps from their door, including waterskiing, jet skiing, swimming, tubing, and fishing for bass, trout, salmon, steelhead and catfish, among a long list of others, while enjoying easy access to Lake Sammamish State Parkat the south end of the lake, and Marymoor Park to the north. Dog owners will really appreciate the latter, referred to as “Doggy Disneyland” by the locals with its 40-acre off-leash dog park where Fido or Fluffy can run in the wide open green spaces and enjoy splashing in the water too. While those water views never get old for Lake Sammamish waterfront real estate owners, there is lots to do off the water too, like hiking and mountain biking the trails in Lake Sammamish State Park, and bird watching, with the wetlands a true treasure trove of bird species, particularly notable for its heron rookery. Although living here is a great way to get back to nature, multiple shopping and dining opportunities can be accessed nearby, and the upscale shops and world-class restaurants in downtown Bellevue are only minutes away. Some of the region’s most luxurious waterfront homes can be found along the Lake Sammamish shoreline. This community is filled with those who enjoy waterfront living, making it easy to fit in with like-minded neighbors. Not only do Lake Sammamish waterfront homeowners get to enjoy all of the amenities the lake has to offer, but a wide range of lakefront properties to come home to. Just imagine your dream home on the sunny side of the lake with prime lakefront, wide open lake views and gorgeous sunsets, a new dock and boat lift, it can all be found right here on Lake Sammamish. Take advantage of our industry-leading tools to make your property search as easy as possible and be sure to register for a FREE account so that you can receive email alerts whenever new Lake Sammamish waterfront real estate for sale hits the market. If you're seeking to sell your Lake Sammamish waterfront property, contact our Waterfront Specialists directly for a comprehensive listing analysis and to learn more about the cutting-edge marketing strategies we'll use to sell your home quickly for top dollar! 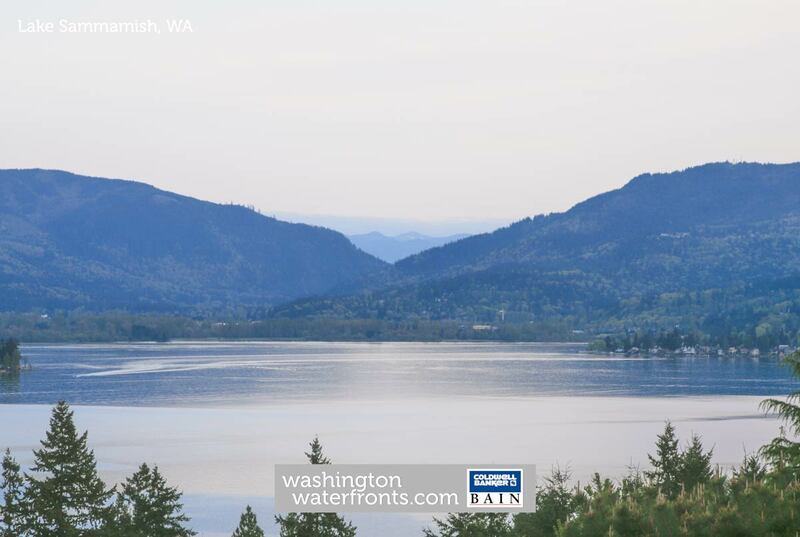 Lake Sammamish is a beautiful freshwater lake located 15 miles east of Seattle and just a few miles west of Issaquah. If you're looking for a peaceful, secluded lake that is more tranquil than those closer to the big city, Lake Sammamish is ideal. One of the best places to enjoy it is by visiting the 512-acre day-use park, Lake Sammamish State Park featuring nearly 7,000 feet of waterfront. The park also includes diverse natural wetlands, a salmon-bearing creek, a great blue heron rookery and one of the largest freshwater beaches in the greater Seattle area. From Seattle, take Interstate 90 east to exit 15 for WA-900 E/17th Ave NW. Turn left, following 17th Ave NW to NW Sammamish Road. Turn left onto NW Sammamish Road and the park will be on your left. The park is open from 6:30 a.m. until dusk year round. If you'll be entering with your vehicle, you'll need a Discover Pass, currently $30 for an annual pass or $10 for a day pass. If you plan to fish, a Washington recreation license is also required. Boaters will find nine watercraft launches here- a daily watercraft launching permit for $7 must be purchased, in addition to the Discover Pass. Fishing is a popular activity at Lake Sammamish with the opportunity to catch cutthroat and rainbow trout, Chinook salmon, smallmouth and largemouth bass as well as brown bullhead catfish. Kokanee and steelhead are also here but off limits. This is Western Washington's premier small-mouth bass lake with quite a few here for many years; fish near the old pilings and submerged trees around the south end of the lake or around one of the docks, floats, or gravel-bottom beaches. This is a quintessential park for summer picnics and an ideal lake for swimming, floating across the water in an inner tube or just enjoying a walk along the beach. If you want to get out on the water but don't happen to have your own boat, you can rent a paddle boat, kayak, canoe or stand-up paddleboards through Issaquah Paddle Sports with rentals available Memorial Day through Labor Day at Sunset Beach. Bring a camera and a pair of binoculars as there is an abundance of birds that call this area home. Just a few you might see include eagles, great blue herons, green herons, king fishers, ducks and geese. Look for the eagles and their nests high up in the trees around the southern part of the lake. You might spot beaver or river otter here as well. If you hope to see a heron, sit in silence near the rookery and you're bound to spot one or more of these magnificent birds. The park also offers several easy hiking trails and the opportunity to go mountain biking through natural areas on paved and dirt roads. You'll find sanded volleyball courts, two baseball fields and two "big toy" children's play areas here as well. While the park does not include a campground, you'll find plenty of accommodation options in nearby Issaquah or Bellevue. It does feature 475 unsheltered picnic tables, plus 80 barbecue grills on stands. There are also two reservable shelters, including a kitchen shelter with two sinks and a center counter with electrical outlets. "The Rotunda" offers three sinks and a central fireplace.